Hello everyone. I'm joining the Once Upon a Time Challenge's Short Story Weekend for the first time today, and I'm going to tell you about three amazing short stories: "The Biography of a Bouncing Boy Terror" by Ysabeau S. Wilce, "Pip and the Fairies" by Theodora Goss, and "26 Monkeys, Also The Abyss" by Kij Johnson. Once upon a time, my little waffles, far across the pale eastern sands, a baby boy bounced from his mother's womb into a dark and dangerous world, into a land well full of hardship, turmoil, and empty handball courts. This boy, starting tiny and growing huge, would one day become a legend in the minds of his minions, a hero in the hearts of his hobbledehoys, the fanciest lad of them all: Springheel Jack! How can you not want to read further? Also, I love the formating of the .pdf. The lettering and the illustrations give it the look of a Victorian pamphlet, which somehow makes it even more fun to read. I'd tell you more about it, but with short stories it's particularly easy to say too much. So I'll just encourage you to read it instead. Next I read "Pip and the Fairies", the reason being that Gavin recommended Theodora Goss to me yesterday, and Gavin has excellent taste. I wasn't familiar with her before, and judging by this story, I had been missing out. "Pip and the Fairies" is the story of Philippa Lawson, whose mother, Susan, wrote a series of children's books starring her as a child: Pip and the Fairies, Pip Meets the May Queen, etc. Years later, and after her mother's passing, the now adult Phillipa can no longer remember if the books were based on stories she told her mother, or if her childhood memories come from the books. She returns to the house where the grew up, hoping the find out. "Pip and the Fairies" is a beautiful story about memory, the imagination, disappointment and loss. And it has an absolutely wonderful and very fitting ending. I won't say more than that, but if you have a few minutes to spare, read it. I saved the best for last: "26 Monkeys, Also the Abyss" is my favourite of the lot. Kij Johnson is quickly becoming one of my favourite writers. In this story we meet Aimee, who runs a carnival act. Her biggest trick is making 26 monkeys disappear onstage. Except it's not really her trick: the monkeys climb into a tub and vanish without a trace. Hours later, they come back, sometime bringing little things with them. Aimee has absolutely no idea where they go, or how, or why. This story is a perfect example of why I love fantasy so much: it takes an outwordly situation and uses it to convey emotions that are familiar to all of us. And it does it better than a realistic story ever could. Also, the writing - how could I not love a writer who comes up with sentences such as these? Aimee has had the act for three years now. She was living in a month-by-month furnished apartment under a flight path for the Salt Lake City airport. She was hollow, as if something had chewed a hole in her body and the hole had grown infected. Because there's always a reason for everything, isn't there? Because if there isn't a reason for even one thing, like how you can get sick, or your husband stop loving you or people you love die - then there's no reason for anything. So there must be reasons. Zeb's as good a guess as any. This story is a finalist for both the Nebula and the Hugo Awards. I hope it wins. Do yourself a favour and read it. You won't regret it. A side note: Via Theodora Goss' website I found this link: several writers recommend YA titles for adults who still stubbornly refuse to read YA. Several books I love were recommended, including Peeps, Ursula Le Guin's brilliant Annals of the Western Shore trilogy, and Terry Pratchett's even more brilliant Tiffany Aching books. The Tiffany Aching books were recommended by Delia Sherman, who also recommended Ysabeau S. Wilce's Flora Segunda, and actually linked the two. That + the fact that Darla D did the exact same earlier this week + Memory's enthusiasm + the story I read today = I caved and finally ordered the book. I also ordered Kij Johnson's The Fox Woman and Skelling by David Almond (I'm blaming Mariel and Nick Hornby for the last one). I had Uglies and Nick and Norah's Infine Playlist in my cart for a while, but in the end I saved them for next time. What about you? Bought any books you're particularly excited to read lately? No, it's not my birthday, but things mean a lot is two today. It's odd: sometimes it feels like I only started this blog yesterday; other times it feels like it's been longer, especially when I think of the friends I've made. I can't believe that two years ago I didn't know Debi or Chris yet, for example. I feel like I've known them for ages. I love the fact that I'm still in touch with the people who commented on my very first post. But I also love the fact that I keep discovering new bloggers and making new friends. Looking back on some of my first book posts, I notice how much the way I write has changed. I think the main difference is that those early posts read a lot line reading journal entries: I was writing without keeping in mind that some of the people who would read my thoughts would not be familiar with the books in question. Although I still think of my blog as a reading journal, I definitely do keep that in mind these days. I like the fact that I do, as it forces me to make an extra effort to put things that would go without saying if I was writing just for myself into words. And doing so makes me realize that maybe they don't go without saying after all. Anyway: the point of this is to say thank you. Thank you for reading, whether you comment or just read, whether you're new or have been with me from the start. And to celebrate, a giveaway! Two years, two winners: one of the winners will get a book of their choice from the ones I've posted about here. The other winner will get a Mysterious Awesome Package. The contents of the package will be tailored to the winner's taste, and I'll do my best to make the Awesome Package truly awesome. Rather than have you comment here to enter, I decided to draw the winners from the comments on all my regular posts at the end of the week. This post will count, but so will everything I post between today and next friday, the 3rd of April. Once again, thank you. This blog has become one of the most rewarding hobbies I've ever had. It's been a fun couple of years, and I hope to be around for many more. Thank you, Nymeth! Your blog is one of my favorite places to come to. If it wasn't for you, Carl, and Chris, I wouldn't be reading fantasy. Now my shelves are lined with a ton of fantasy titles. You are the best! Kind and an advocate for comments on small blogs, you make everyone feel welcome. Thank you. But it felt like you have been blogging for more than 2 years. It's true that you and Carl and Chris are responsible for many fantasy books being read by many of us!! Happy blog birthday! I hope you stick around for many more years, too! I really want to check out Ysabeau S. Wilce, especially now that I have your recommendation to add to Memory's! Happy Blogiversary! And thank YOU for being such a wonderful blogger. Yay, happy birthday Nymeth!! You are definitely one of my faves, and it's been such a pleasure getting to know you throughout the time that I started blogging, a little over a year ago. Happy Blogiversary! Two years is very impressive. Happy blogiversary Nymeth!!! You are truly without doubt one of the shining spots in my blog reading day. :) Here's to many more! Happy blog birthday, Nymeth! Your blog is such a pleasure to visit each day, and you've brought so many wonderful new books and authors into my life. Here's to many more years of sharing books! Happy birthday to Things Mean A Lot! The cat deserves the cake! Hahaha! Will save the three short stories you mentioned here on my files. They should tide me up when I'm feeling a bit of short story reading when I'm doing something else on my PC! Ooh, you bought Nick and Norah!!! Too excited for you! Hope you enjoy it (and the Uglies series too). Congratulations and happy 2 years! Hard to believe it has been two years! I guess I mostly missed the second year, though, with my whole anti-social activities of 2008! It's been really great talking to you lately, though! Happy birthday! haha! Me again. I have Flora Segunda here to read. Care to buddy read it like we did with East? Here's wishing you many more years of book blogging! I'm so glad you liked your first dip into Wilce. I hope you enjoy her novels, too. And ooh, new stories to check out! I've only read a couple of things from Kij Johnson, but I enjoyed both of them very much. I'll have to make some time for "26 Monkeys, Also the Abyss." Woo! Congratulations on your 2nd Blogiversary! I look back on some of those early posts on my blog and cringe a little. The reviews would be very different if I wrote them now, but what can you do! Shows growth I think! Happy, happy, happy blog birthday!!! Oh my, I know it's a tad silly, but I'm crying. Crying because this really is such a special day. Seriously, I cannot imagine my life without you! And you know I mean that with every fiber of my being. What if you had never started blogging? What if I'd never met you? Oh my, that's too horrible to contemplate. And I honestly cannot believe that I first met you less than two years ago! Maybe because I feel our friendship is such a comfortable one, such a special one, that surely it must be decades old. I am so very grateful you started this journey...HAPPY BLOG BIRTHDAY! Ooooh, and three awesome sounding short stories I must read! Renay had a link to one in her post yesterday(?) that I really want to read, too. You know, I'm finding I can do pretty well reading short stories on-line...maybe I will just have to try me a book one of these days. Oh happy blogiversary! I love reading your blog! Happy birthday to your blog, Nymeth! 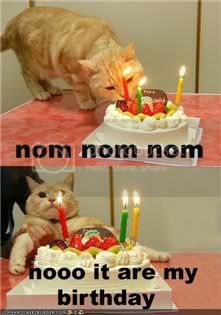 I love the photo of the cat eating the cake. :-) Anya would like a piece too, thank you very much. She promises to share with Parker and Riley. Maybe. I am reading a book of short stories--but I don't think it would fit in with the challenge. Maybe next time. 23 Monkeys, Also the Abyss sounds wonderful. I hope you have a great week, Nymeth. Happy Blog Birthday. I enjoy reading your blog! Happy blogoversary! The bloggy world would not be the same without you! Happy blog birthday! Love those LOL cat pics. I'm glad you've joined the Once Upon a Time challenge this year. I joined last week (I'm taking The Journey) and am soooo excited about it. I just started reading "Dreams Underfoot" by Charles de Lint. This is my first de Lint and I'm hooked! I love his way of approaching magic. I also joined Sunday Salon this week. Whoo-hoo! Again, congratulations on your two year blog b-day. You have a wonderful blog and I always look forward to reading your posts. Happy 2nd Birthday!! Your blog is great and I'm so glad that I found it!! You listed so many things to read and think about. I'm going to have to come back and re-read it again!! Tiffany Aching- where do I start? The 26 Monkeys..sounds weird and intriguing...must see what that is all about too!! Your excerpt from Springheel Jack made me laugh!! Congrats on a wonderful two years! I hope you have many more! This post filled me with warm fuzzies :) I second everything Debi said! It seems like I've known you much longer than 2 years and I certainly consider you one of my best of friends, blog or non-blog. Happy Blogiversary Ana!! Is that your cat eating cake? And you know you are totally awesome :-D a fabulous reviewer, and most importantly, kind and thoughtful. May you have many more years of joyful blogging in front of you :-D just as I look forward to years of friendship with you. I have the Theodora Goss book, I think i know which story I'll be reading first! lol I have to catch up to you with the short Story weekends, I've been bad so far, missed them both. I hope to feel better very soon! Happy 2 year blogiversary!!! I haven't been with you since the beginning but I did know about your blog here (didn't everybody?). I was a bit intimadated by your reviews because they were so good lol. *toast* So here's to many more years!!! I like the sound of The Biography of a Bouncing Boy Terror. The pdf looks fun, I like the artwork as well. Happy Blog Anniversary, Ana! Thank you for your friendship. Thank you for your great reviews. Thank you for being you. God bless you, dear friend! It's crazy how I can go back remembering my pre-blogging times and realise how different they were! as for the short stories, they all sound awesome. I gotta say short stories are growing on me, and although I will always prefer reading longer fiction, I won't shy away from them anymore like I used to! Vasilly, thank you so much :D I can't tell you how happy it makes me to hear that! Dark Orpheus: You're also one of the bloggers I feel I have known for more than 2 years! Lightheaded: lol, I think he does too :P I almost bought Nick and Norah and Uglies, but ended up clicking save for later at the last moment. Next time, though, next time! Memory: Thank you! I bet I'll enjoy the novels a lot. You know, I remember you saying you didn't like your first experience with Pratchett a lot, but have you read the Tifanny Aching books? (First is The Wee Free Men). I keep seeing them compared to Wilce's stuff! Marg: lol, I can't help the cringing either :P But it's good that we learned and evolved as we went along! Debi: Awww :D It does feel like we've been friends for much longer. You're the best, my dear. I'm glad reading stories on the computer has been working better for you lately! You need to read 26 Monkeys at least...I think you'd love it. Court: You were also one of the first to stop by and comment. Thank you! Gavin: I have a feeling I'll love The Fox Woman. Thanks again for the recommendation! Becky, thank you so much :D It definitely wouldn't be the same without you either. Staci: The first book is The Wee Free Men, followed by A Hatful of Sky and Wintersmith. They're a perfect introduction to Terry Pratchett's awesomeness! And thank you so much :D I'm very glad to have founds yours too. tanabata: Yours is one of my must reads also :D Thank you for the good wishes! Susan: Thank you, thank you :D I look forward to more years with friendship with you too :D You know you're one of my dearest blogging friends, and I think YOU are totally awesome! Mee: Thank you! And no need to stop; I enjoyed hearing about how you got into blogging! Ladytink: I'm very glad you're no longer intimidated, as your comments are always appreciated :D And lol, I didn't mean to be sneaky :P Any newcomers are more than welcome to enter, but I thought it'd be fair to give my regular visitors a good chance. Rhinoa: I love the art too! And thank you! Heather: Thank you! Even though we have (mostly) different taste, I always enjoy reading your thoughts, bookish or otherwise. Valentina: It really does! You know, I remember how I first discovered most of my closest blogging friends, but not you! Do you happen to remember? Maybe it was OuAT...did you join two years ago? And yay for short stories growing on you! Happy Blogaversary Nymeth! Wow, the time flies doesn't it. I'm so happy to have met you in this bloggy world and I hope you continue on for many more years. I may not always comment but I'm always reading and always amazed by your awesome writing. and those short stories sound good, especially pip and the fairies. Thanks for the link to the Wilce story - I had made up my mind to find her short stories after rereading Flora last week, so that will be a great start. I'm excited you're going to read it! The pressure's on now - I hope you love it the way I did. Happy blog birthday! It made me realize I'm a couple weeks away from my 2 year one, too. It does seem like ages that I've known you and so many others, too. Who knows where another 2 years will take us?! Hey, Happy Blog Birthday! Two years! It seems, and I mean this as a compliment, much longer than that. I cannot believe that I blogged a few years before we ever met! It cannot be! So wonderful to be in the same community with you, you are a real gem! Great short stories for the weekend! I have only read a few Theodora Goss stories but really enjoyed those. I need to pick up her book! I have read a few graphic novels that featured Springheel Jack, but I know precious little about the character. Must read more! Happy blogiversary! I love your blog. Poor kitty- he wants some cake! 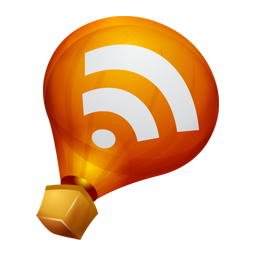 I know I'm behind the times (and on my Google Reader, obviously), but Happy Blogiversary! Two years is a long time in blog-land, especially for someone who obviously puts as much time into it as you do! Here's to many more years of good reads (and reviews)! Happy Blogiversary! I lurk usually, but I love your reviews, they always make my day. Thanks for everything! Happy happy birthday! And I do hope you love Skellig! Dar: Aww, thank you so much! I'm also always reading yours, and I'm very glad to have met you :) You're one of the nicest bloggers around! Naida: Thank you so much! Darla: Don't worry, I also have Memory to blame if I don't love it :P But you know, I'll be very surprised if I don't. And it does feel like ages! Trish: Yep, they count! And awww :D It's not mushy! Or if it is, who cares :P You know the same goes for you, right? You're one of my favourites, and blogging wouldn't be the same without you around! Carl: It does seem much longer! You were the very first person to comment here, and to this day you remain one of my main inspirations in blogging, so thank you :D Graphic novels with Springheel Jack! I like the sound of that. Jeane: hehehe :D He does. Marie: It'll last as long as Once Upon a Time does. I might not be able to join in every weekend, but I'll try to as often as possible. I need some encouragement to read more short stories! Hawkeygirl: Thank you so much! Mariel: I think I will :D Thank you! Congratulations on the second birthday of your blog. I hope you keep it up! Happy Blogging Birthday! I think your site is one of my favorites on the web, so I hope you continue to do this for a long, long time. Also, that 26 Monkeys book sounds awesome!